BLUES BROTHERS: Paul Joseph, left, and DJ Riddick have been cranking out swampy, DIY garage blues since 2013. ‘Holy Water’ is the fifth release from the Florida-based duo. Swamped in distortion and groggy as a hangover, the heavy blues of 100 Watt Vipers conjures images of dusty saloons, road-weary bikers and that morning stumble across the room in search of the day’s first drag. Lean, but muscular, the fiercely DIY duo (yes, duo) from Jacksonville, Florida merges the howl and twang of the Delta Blues greats with the more contemporary stylings of Jack White — and then piles on the heavy voltage of AC/DC (“Aces High,” “We Ride On,” “My Old Bible”), Black Sabbath (“The Thunder Cries”), Led Zeppelin (“Holy Water,” “Ain’t Got No Golden Cup”) and the stoner version of Corrosion of Conformity (“No Salvation in These Fields”). It’s kinda like the heavy metal cousin of the Drive-By Truckers. Singing drummer DJ Riddick has the kick of John Bonham and a gritty voice that recalls Pepper Keenan, Zakk Wylde and Ronnie Van Zant. Guitarist Paul Joseph brings a wall-of-fuzz guitar sound that could startle Leslie West (not to mention a psychedelic slide that harkens Jimmy Page). 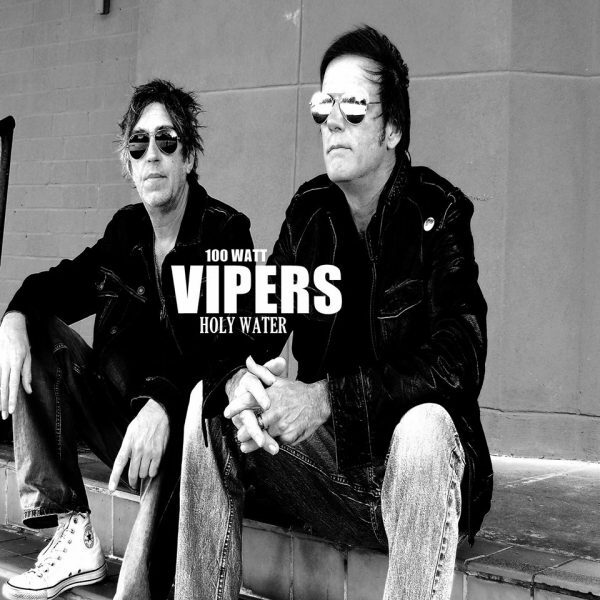 Cranked to full effect, 100 Watt Vipers would be a suitable opening act for doomy rockers like Black Label Society, Down and the aforementioned COC. Dialed down and acoustic, they’d pair nicely with, say, Blackberry Smoke, Jason Isbell and Steve Earle. Truth be told, “Holy Water” drones a bit due to the song template of mid-tempo/high distortion and the lack of bass guitar, which would buffer and add dimension to the album’s overall sound. Then again, that probably runs counter to the bare bones intent. In the end, repeated listens yield hidden nuances and increasing rewards, and songs like “I Am The Traveler” (my favorite) and “After the Storm Comes the Peace” reveal a songcraft that’s worth the dig.